Ok, ok, I know that this is my second pasta dish in 2 weeks, but I had pasta maybe once this summer and I've been craving it. I was going to wait and do this post, but then I realized that many of you probably are looking for an easy and healthy side for Labor Day Weekend BBQ's so I decided to post it today. This is another recipe inspired by Ina Garten. It makes a lot so its perfect to bring to a big family gathering. 1. Boil water in a large pot. Cook broccoli for 3-4 minutes until softened and bright green. Remove from water with a slotted spoon. 2. Add pasta to boiling water and cook according to directions. 3. While pasta is cooking, warm up butter and olive oil in a small sauté pan. Add the garlic and lemon zest and cook for 1-2 min on medium heat until you can smell the garlic. Take off the heat and add lemon juice, black pepper, and salt. 4. 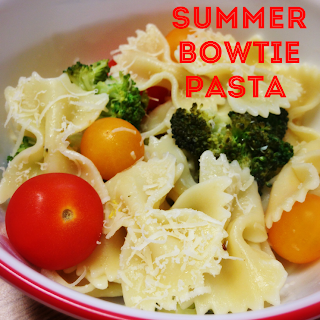 After you've strained the pasta, add the broccoli, lemon sauce, parmesan, and tomatoes. Toss and serve! This recipe may look like it has a lot of ingredients, but many of them are staples around the house. It's a simple meal that can be thrown together in 20 minutes.